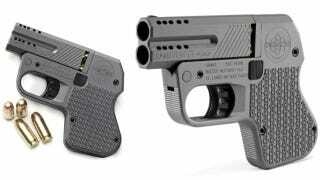 Measuring a mere 5/8ths of an inch thick and weighing just 14 ounces, Heizer Defense claims its new DoubleTap tactical pocket pistol is the smallest and lightest .45 caliber handgun you can buy. It's available in an aluminum version starting at $500, but we highly recommend opting for the $730 titanium model instead. It's a little pricier, but what's cooler than packing heat made from the same material as stealth fighters?